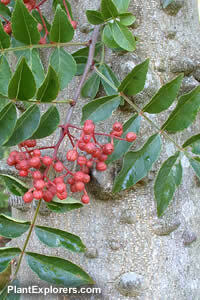 A large deciduous shrub or small tree with bright green pinnate leaves. The trunk and branches are well armed with broad pyramidal spines, but otherwise sport smooth grey bark. Panicles of pale green flowers are produced in early summer, followed by clusters of aromatic pink fruit in the fall. Height 20 feet; spread 15 feet. The young leaves, which have a distinctly citrus flavour, are used in Japan as both a vegetable and a garnish. The seeds, which can be gritty and even bitter, are not as flavourful or as spicy as the pink pericarp (seed coating), which is a popular spice in many oriental dishes. For maximum freshness, please keep seed refrigerated in its original packaging until it is time to plant. Sow seed in containers of standard starter mix in the fall. Place in a coldframe and check occasionally to ensure they do not become either overly wet or overly dry. If seed is stored, cold stratification for 3 months may assist in germination, though scarifying the seed is also helpful. Grow on in well-drained, moderately fertile soil in full sun.